Welcome to our Horse & Show page. We have owned Horses for over 9 years and both my Daughters have been riding since they were 5 & 7 years old. Charlotte owns Magical Star, a non Papered TBX mare who is an excellent jumper and is a steady loving horse. Last year Charlotte came 3rd in the Eaglesfield Show Jumping Championships. She has just qualified for this years with a Six Place Rosette. The Championships are in March 2006. Jessica owns Abby (Lleredin The Manageress). A registered Welsh Section D with the Welsh Pony and Cob Society. She is a very pretty mare with Rocking Horse good looks! 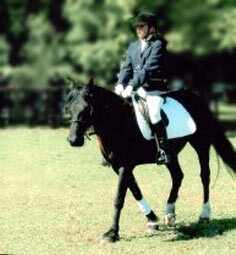 Jessica is a keen Dressage rider and enjoys showing in hand. Jessica is taking Lessons with Sarah Williams - Dressage Teacher. 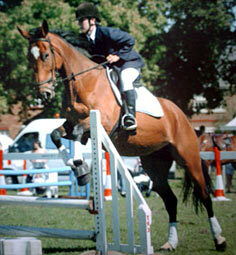 We have had some very good wins last year and aim to continue to compete at Show Jumping, Dressage and In Hand Showing. We often arrange local club events for B.A.R.C. Bow Arrow Riding Club. I am just a Happy Hacker, happy if I get an hour on Star to the pub and back!